It’s raining! On the Olympic Peninsula of Washington State, this is the first real rain since maybe July! Temps are into the 50s and 60s again. A lot of our readers are still fighting temps in the triple digits, but I do hope the temperatures where you live are finally moderating. September is probably your last opportunity, under normal circumstances, to easily breed rabbits. As the hours of daylight shrink, our rabbits return to winter mode, meaning they may show increasing reluctance to accept the buck. Leave the lights on in your rabbitry from 6 a.m. to midnight. Should the doe be unwilling the first time, re-try her with a different buck, or repeat the breeding attempt every day or two until willing. The mountings can trigger ovulation and the hormone changes that will improve her receptivity, especially as you pay attention to lighting and nutrition. Last, but not least, the heat of summer can render a buck temporarily sterile if your cooling measures were weak. Even if does are receptive, 'breedings' may not result in kits for 6-8 weeks after 90+ temperatures have subsided. We’ve begun to tackle a big topic - every one of the various rabbit breeds across the globe. That’s somewhere near 175 different rabbit breeds, maybe a few more! It’s going to take us a while to amass the information and write descriptions and concise info about each of these breeds, but we’ve rolled up our sleeves, and started in. Eventually we’ll have a page dedicated to nearly every breed, if we can find enough information. Some breeds are specific to countries like Morocco and Czechoslovakia. It may be hard to be as comprehensive as we’d like in these cases, since we don't speak 15 different languages, but we’ll try! Tip: If you have rabbit breed information that we’ve failed to find, please let us know by either commenting on the specific breed page, or via our Contact Us page. We’ll give you the credit for the information and link to your website, if you have one. This is a lovely chestnut agouti Satin Angora Rabbit. 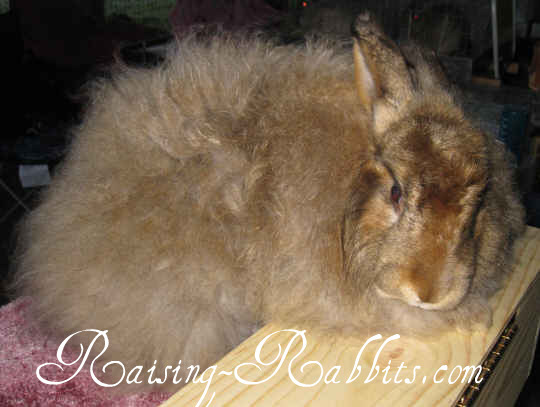 We feature this rabbit as we are currently working on presenting information about the various Angora breeds. See Angora Rabbits. No rabbits are harmed when wool is harvested. When you see the wool starting to hang off the rabbit in long clumps, that means they’re molting. You can pull the fur off the rabbit’s back and sides without hurting it. The remaining wool can be sheared. Once sheared, be sure to pay attention to the ambient temperature for up to two months, while the animal’s coat is sparse. The Vegetarian Myth, by Lierre Keith, was published in 2009. Ms. Keith spent 20 years of her idealistic life as a strict vegan on moral grounds. As her health deteriorated, and as she began learning how to raise her own food, she finally discovered it is impossible to be a vegetarian, much less a vegan, in a sustainable environment. We strongly recommend this book, so you can evaluate for yourself the idea that vegetarianism might actually harm the planet. Is Ms. Keith right? Or misguided? Are there better ways to ‘save the world’ besides the desert-inducing annual wheat fields of the vegetarian? Read it for yourself, and see what you think. Want a bit of a preview? "Life is literally a process of one creature eating another, whether it’s bacteria breaking down plants or animals, plants strangling each other, animals going for the throat, or viruses attacking animals. 'All of nature is a conjugation of the verb "to eat,"' in the words of William Ralph Inge" (76). "I had built my entire identity on death being an ethical taboo, a moral horror, one that provoked a visceral shudder through body and soul. But 'death-free' is not an option that the processes of life offer us. 'We can dominate or we can participate, but there’s no way out,' a friend who grows her own food offered. We can rail and cry all we want, but in the end we have to make peace with the world, the good, green earth we claim to love so much but understand not at all. ... Eventually we see our only choices: the death that’s destroying life [factory farming and monoculture] or the death that’s a part of life" (77). In that spirit, take a look inside nearly any rabbitry over a time span of a few years. You’ll see that the population of rabbits has actually grown in numbers and has improved in overall health and quality despite the selling, butchering or consumption of many rabbits. THIS is what Ms. Keith characterizes as the individual death that is a part of the bigger picture of life. The Vegetarian Myth is available at Amazon.com (see link above). Does your rabbit have cataracts? You’ll know it by the milky white pupil instead of the dark clear window into the rabbit’s soul. Dr. Blair of Animal Eye Care of Richmond VA can restore your rabbit’s sight for ‘just’ $1000 for both eyes. "I don’t charge as much for rabbits," says Blair, "and I have fun doing it." Tip: Aurora Rex Rabbit Ranch has already worked hard, eliminating from the herd the recessive gene that causes cataracts in the first place. Other reputable breeders do the same, so you don’t have to worry about your pet rabbits or your breeding stock going blind. Purchasing your pet rabbit from a reputable breeder could save you a LOT of money down the road! Do you have a house bunny? Does it roam in the same space as the family dog or cat? It's a yucky subject, but you might want to know that the rabbit is the intermediate host for the dog tapeworm called Taenia pisiformis, and very occasionally for the cat tapeworm as well. Up to 65% of wild cottontails in some areas are thought to be infected with tapeworm cysts, and these carry the potential to infect your animals. If you spot something like fettucini hanging out of the hind end of your dog, you’re probably looking at a mature tapeworm. Your dog may be shedding tapeworm eggs. The eggs need an intermediate animal in which to grow from a tiny egg to an immature cyst, and this animal is the rabbit. If your dog shows up with tapeworms, Be sure you appropriately treat both your dog and your rabbits. We don't want to be alarmists, but this is information to be aware of if your dogs and rabbits share the home or the yard, even if not at the same time. For more info: Tapeworm Life Cycle.